For instance, the Chablis appellation–the most northerly part of Burgundy and which is devoted entirely to chardonnay–is renowned for steely, minerally wines. They are often described as having a “gunflint” characteristic which can be attributed to the limestone soil of the area. As such, they are great with shellfish, particularly oysters, I’ve found, but also delicious on their own. Many lower-level Chablis producers only age their wines in steel tanks or neutral oak, so these are good deals for those of you who don’t really like oak. Other producers barrel ferment, but still, you won’t find Vaynerchukian “oak monsters” lurking here. And so our first chard of the evening–not counting a blanc de blanc Champagne to start things off–was the 2007 Laurent Tribut Chablis ($25-$30), a basic Bourgogne blanc level wine that was tart and minerally. It had good weight in the mouth, though its striking acidity convinced me that this would be best as a food wine. The next was my favorite white, the 2007 Les Vins du Moulin Mâcon-Villages. Just as Chablis is the most northerly part of Burgundy, Mâcon is in the broader region known as the Mâconnais, which is the most southerly portion (not counting Beaujolais, which most people wouldn’t consider part of Burgundy anyway). It is primarily a white region, producing mostly basic Bourgogne blanc. For only a bit more money you could and should buy a wine with the much better Mâcon-Villages designation. Les Vin du Moulin is Mâcon-Villages and is produced independently by Jean Pierre and Michel Auvigue (and not through a cooperative, through which model over 75% of Mâcon wine is made). It was rounder and more generous than the austere steely Chablis; it had some oak but stayed away from tasting toasty or oaky. Rather, it was well-integrated and reminiscent of honey. This was a solid wine and, at $15.99, a great and affordable introduction to white Burgundies (and thus an answer to number four above). Our last chardonnay was the 2006 Louis Jadot Chassagne-Montrachet ($50) (sha-san-ye mong-ra-she). Chassagne-Montrachet is the second-most southerly appellation of the Côte de Beaune, which itself is the southern half of the famed Côte d’Or (“Slopes of Gold”), considered the heart and soul of Burgundy. The northern portion of the Côte d’Or, the Côte de Nuits, is almost exclusively devoted to red wines; the Côte de Beaune produces both red and white though whites dominate. I was excited about the Chassagne-Montrachet. This appellation has (as of 2001) a whopping fifty-two premier cru vineyards, though with only one grand cru vineyard. 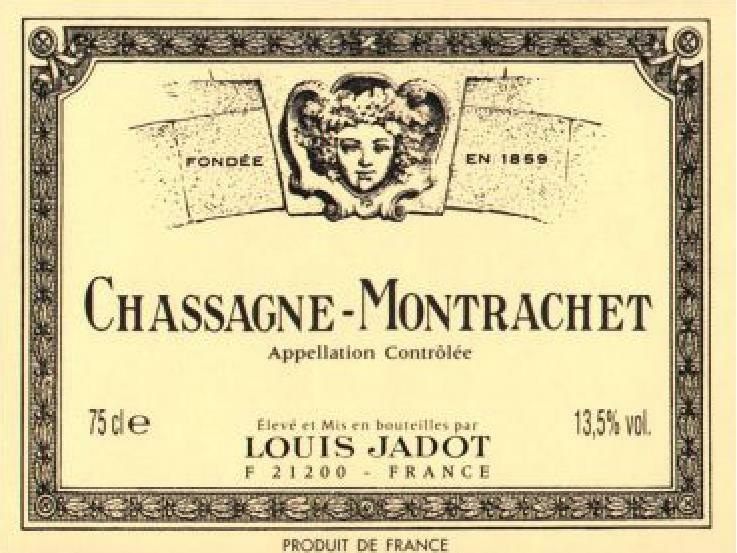 Louis Jadot is a négociant–a sort of wine merchant/producer that buys grapes from growers and vinifies them–with a good deal of cachet. My excitement was tempered a bit by the fact that this particular bottle was not from a premier cru vineyard but from the more general appellation designation. Nonetheless, I opened it and let it breathe for a while. This wine was oily and viscous–good qualities–and redolent of lime. Bright citrus, with a nice dagger of acidity. It was fuller and rounder than the Chablis but less generous and oaky than the Mâcon-Villages. It was sort of an interesting middle ground. Although well-made, for an introductory white Burgundy I would recommend the Mâcon-Villages over this. I would definitely like to try a Chassagne-Montrachet, however, from a premier cru vineyard. Overall, the whole evening was a success. I think the pinots showed better on average than the chardonnays, but I think the best value of the evening was the Mâcon-Villages. Look it up and drink it up! You should check out Puligny-Montrachet. There is some great stuffing coming out of there. White Burgundy (mainly the chards) is one of my most favourite things/regions in wine. I enjoy the pinots, but for my money Burgundian chard is the greatest white wine on the planet and, as you point out, comes in so many styles it is mind boggling. Yeah! I definitely intend on checking out more Burgundies when I get back to DC. Are there any producers of Puligny-Montrachet you would recommend, sir? Hm, well I’ll give you more broad burgundy recos’. Check out Pierre Morey for Mersault or even basic burgundy – he is fully biodynamic and awesome. Also Domaine Leflaive. Nice! I’ll keep an eye open for these producers now that I’m back in DC. For Pulligny-Montrachet try Domaine Rémi Jobard .